← Monday of the Oh Noes! I’m running a little behind this morning. Okay, I’m a lot behind. Because…reasons. Anyway, it’s hot outside and sometimes you need something cool, light and chocolaty. 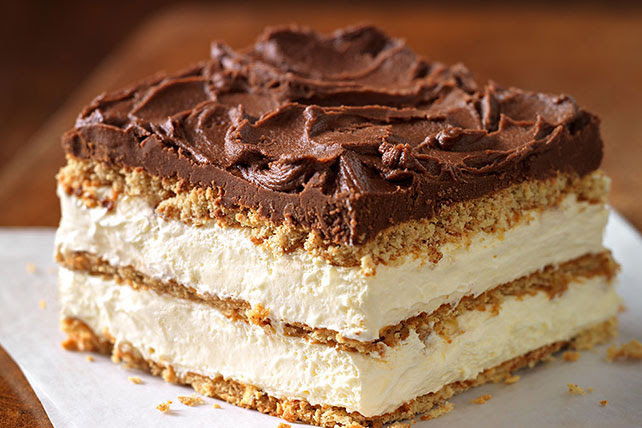 Today, I picked this Graham Cracker Eclair Cake from Kraft Recipes! Beat pudding mix and milk in large bowl with whisk 2 min. Let stand 5 min. Meanwhile, cover bottom of 8-inch square pan with graham squares, overlapping as needed to form even layer. Click for more info and a VIDEO FROM KRAFT to see how it’s done. I’m pretty sure Jo Mayweather the Djinn heroine of B.E. Sanderson’s Once Upon a Djinn series would enjoy this dessert. She might even make it…or not. 😉 There’s a giveaway for the 3rd book in series on Goodreads. CLICK HERE to sign up for a chance to win, and be sure to check out the other books in the series. This entry was posted in Writing Life and tagged books, characters, contest, food, fun stuff, links, recipe, Tuesday Treats. Bookmark the permalink. LOL, I think Jo would definitely love it. But she’d probably wish it up rather than make it. Now, Jeni – my current heroine – would inhale it. Especially since she eats when she’s stressed and she’s definitely stressed right now. And thanks for the shout-out! Good luck to everyone who enters!